There are many places all around Greece that are ideal for enjoyable and fun filled holidays. The Pelion peninsula is one of the most unique and beautiful, and is idael for holidays throughout the year. There are many charming resorts and coastal towns all around Pelion. The south coast of Pelion is a very popular destination for holidays, and it is here you will find our village of Kastri. If you are looking for a place where you can escape from the noise and stress of city life and simply unwind and relax, then Pelion is the perfect place for you to do this and enjoy time for yourself. The unique and picturesque region of the Pelion peninsula is the perfect place to escape from the stress and noise of city life, and get back to nature at it's most purest and beautiful. The combination of mountains and sea provide Pelion with a landscape that is unlike any other in Greece. It is a place where the colours of green and blue blend together, creating scenery that will enchant and inspire you. Pelion comprises of a unique collection of villages, coastal resorts and hamlets, each of which has it's own beauty and charm, and which are ideal for visiting when you take you Pelion holidays. The small charming hamlet of Kastri, located on the southeast tip of the Pelion peninsula, and approximately 68km from Volos, is an ideal destination for those who are seeking to enjoy the natural beauty and peace and tranquility that Pelion provides. 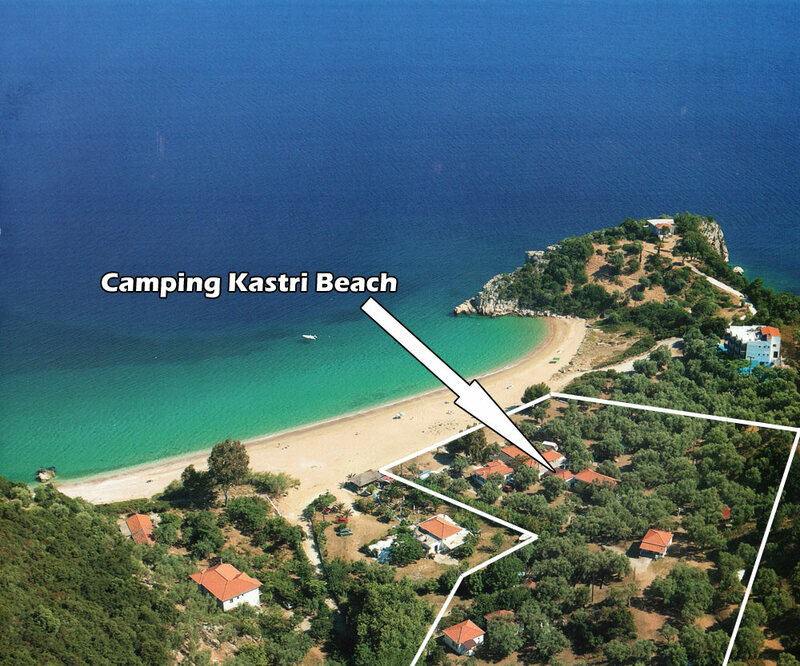 It is here in Kastri that you will find "Kastri Beach Camping", where we operate our campsite here in Pelion. Open from May through to September, our campsite is perfect for those seeking to enjoy camping holidays in Pelion.